Eureka, we are back to spoilage yeasts. Today, I would like to introduce another spoilage yeast called Kluyveromyces marxianus (anamorph Candida kefyr). A yeast first described by EC Hansen in 1888 and named Saccharomyces marxianus after Marx, the person who originally isolated K. marxianus from grapes [Fonseca et al, 2008]. K. marxianus can be isolated from dairy products, kefir, yoghurt, fermented milk, pozol (Mexican fermented corn dough), sorghum beer, cheese, prickly pear, decaying plants and insects. And a study reveiled, that K. marxianus is even involved in coffee fermentation [Jeong H et al, 2012; Kurtzman et al, 2011; Masoud et al, 2004; Vieira-Dalode G et al, 2007]. I could not find a study where K. marxianus could be identified/isolated from barley based beers. Nevertheless, there is more than just barley based beers. I would like to quickly discuss another malt based beverage called gowé made in Bénin, West Africa. This beverage is available as a cooked paste which gets diluted with milk and water leading to a sweet beverage [Vieira-Dalodé et al, 2007]. Never tried gowé myself and honestly haven’t heard about it before either. A study to identify micro-organisms involved in the production of sorghum gowé identified K. marxianus as a dominant yeast species [Vieira-Dalodé et al, 2007]. 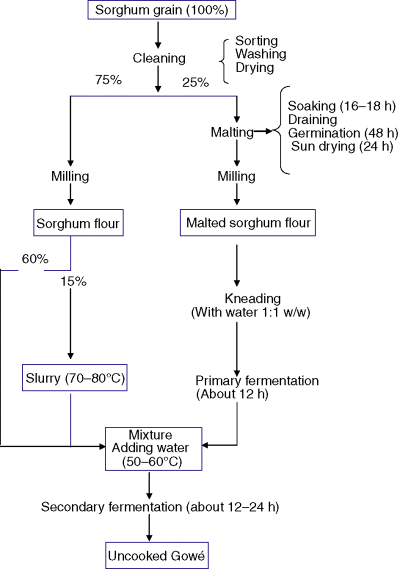 Gowé is made from malted sorghum (Sorghum bicolour) according to the work flow shown in Fig 1. The sorghum grains are cleaned and divided into two parts. 25% of the grains get soaked, drained and left for germination before sun dried. A process very similar to the malting process used to make barley malt. The malted sorghum gets milled and kneaded with water. This mixture is left for a primary fermentation. The 75% part of sorghum is left nonmalted and 15% is combined with hot water to form a slurry which is re-combined with the remaining 60% of the nonmalted sorghum and the fermenting dough to form a mixture with a temperature of about 50-60°C. This mixture is left for a secondary fermentation resulting in gowé. Vieira-Dalodé et al took samples during primary and secondary fermentation to identify the lactic acid bacteria and yeasts involved in the fermentation of gowé. The authors could identify K. marxianus, Pichia anomala, Candida krusei and Candida tropicalis during the fermentation. K. marxianus as well as P. anomala were present from an early stage on and the most important species during the first hours of primary fermentation. C. krusei and C. tropicalis peaked after 12 h.
K. marxianus has several biotechnological applications and is used to produce beta-galactosidase, inulinase or pectinase [Jeong et al, 2012].. Since this is yet another yeast with biotechnological applications, its genome was sequenced in 2012 by Jeong et al. The authors sequenced strain KCTC 17555 using Illumina Genome Analyzer IIx and assembled a 10.9 Mb genome allocated into eight chromosomal groups. Of 4,998 predicted proteins, 91% were also present in Kluyveromyces lactis. Furthermore, key enzymes for xylose assimilation are also present (as previously discussed in Pichia kudriavzevii) suggesting this yeast can be used for biofuel production as well [Jeong et al, 2012]. As K. marxianus is present in dairy products and many other sources, it is very likely one could pick up this yeast from these sources. The challenging part would be to identify K. marxianus from all the possibly isolated yeasts. Data summarized from Kurtzman et al (2011). Since K. marxianus is negative for maltose fermentation, it is very unlikely that a single K. marxianus beer fermentation would work (as mainly maltose is present in wort). So far for the theory. If anyone out there silly enough to try this yeast for a beer fermentation, please let me know. Over and out.